Rescue workers at the scene where a Tesla Model X crossover cashed into a barrier on U.S. Highway 101 in Mountain View, Calif., on March 25. 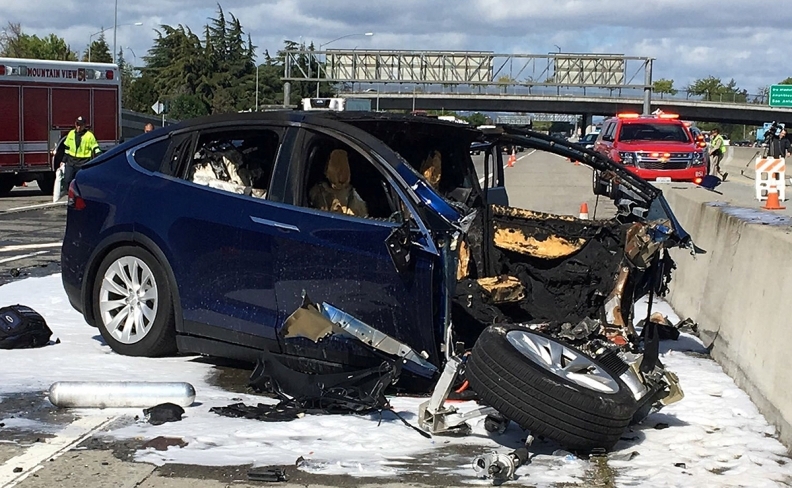 The Tesla Inc. Model X that crashed in California earlier this year while being guided by its semi-autonomous driving system sped up to 71 miles an hour in the seconds before the vehicle slammed into a highway barrier, federal investigators said Thursday. The National Transportation Safety Board issued a preliminary report on the March 23 crash showing that the driver’s hands were detected on the steering wheel only 34 seconds during the last minute before impact. The investigation is the latest to shine a spotlight into potential flaws in emerging autonomous driving technology. Another NTSB probe of a self-driving Uber Technologies Inc. car that killed a pedestrian March 18 in Arizona found that the car’s sensors picked up the victim, but the vehicle wasn’t programmed to brake for obstructions. Walter Huang, a 38-year-old engineer who worked at Apple Inc., died in Mountain View, Calif., in the March 23 crash when his Model X struck the barrier as he was using the driver-assistance system known as Autopilot. The car’s computer didn’t sense his hands on the steering wheel for six seconds before the collision, according to NTSB. A Tesla spokeswoman declined to comment on the NTSB’s report and pointed to a March 30 company blog post. In the post, the company said the driver had about five seconds and 150 meters of unobstructed view of the highway barrier but took no action to avoid the collision, citing vehicle logs. The Tesla was following a lead vehicle at about 65 miles per hour 8 seconds prior to the crash. A second later, the car began to steer left while still following the lead vehicle. Four seconds before the crash it was no longer following the lead vehicle, the NTSB said. The NTSB originally announced it was looking into a fire that erupted in the car’s battery, which was damaged in the impact. The agency is also investigating a May 8 fire in a fatal Tesla crash in Fort Lauderdale, Fla. In Tesla’s May earnings call, CEO Elon Musk dismissed the notion that Autopilot users involved in accidents have the mistaken belief that the system is capable of fully-autonomous driving. Driver complacency is more of a challenge, he said. The NTSB is also investigating two other incidents involving Teslas: An accident near Los Angeles in January in which a Model S struck a fire truck parked on a freeway while the car was on Autopilot and a Model X that crashed into a garage in August in Lake Forest, Calif., and its battery caught fire.